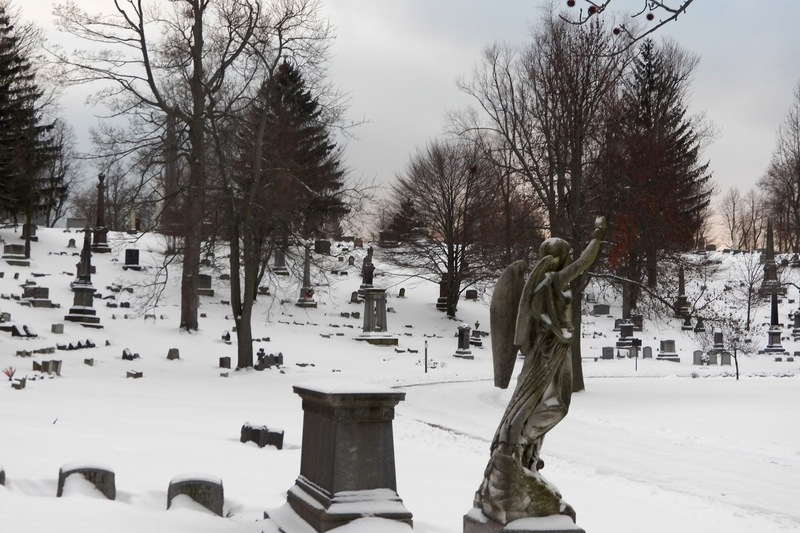 Earlier in January, I ended up one Saturday in a section of Forest Lawn I'm not often in. Near one of the cemetery's lakes, there is a section filled with large, more modern mausoleums and statues-- some of which I have photographed before. Behind a row of medium sized mausoleums is a growth of trees and a riverbank, which leads to one of the quieter parts of the creek inside the cemetery. The spot is a safe little place ideal for quiet, thinking, calm. But I had never noticed what you can see there, up at the top of the hill on the opposite side of the area. One would think I hadn't noticed the mausoleum at the top before because of the heavy trees which, with their leaves, must surround and shroud the hill during the spring, summer and fall months. The mausoleum stood at the top of the hill, imposing. As I started to climb up the hill it stands on, I realized I'd never been up there before. And I'd picked the perfect day to start. The photos don't show how steep the hill actually is, I believe, and how difficult it was to climb through a fresh inch of snow up to the top. A newer section of the cemetery, most of the stones along the way were new, fresh and modern-- and contrasted with what lay at the top. 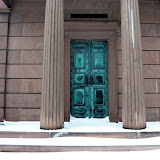 Up close, the mausoleum is even larger than I'd expected. Though several random, separate markers populate the hill at the top, none appear connected to the mausoleum which bears no name. 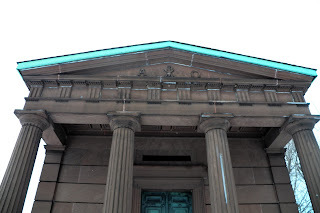 The Greek symbols/lettering for the Alpha and the Omega decorate the piece above the door-- and that is all. I searched for a name plate, a marker or something bearing a name, to no avail. Barring the slight possibility that something lays on the ground around the structure, the monument appears to be nameless. Once again, as so often within the cemetery, I was wondering. "Who were you?" 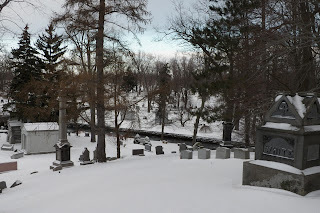 From the mausoleum, you are able to see much of this area of the cemetery. All of the section around the lake is visible-- and across the creek, to the first of the older sections of the cemetery, such as the one where the Pratt Monument lies. 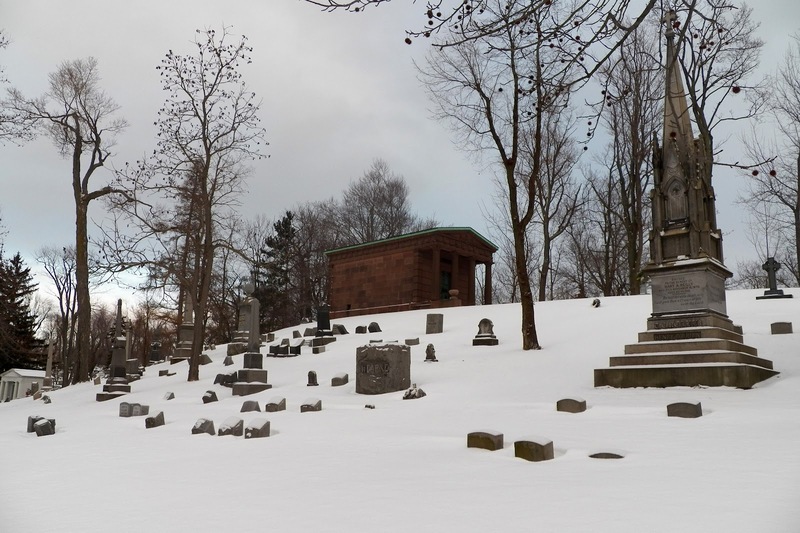 Behind the mausoleum, there is another steep hill down to the creek, with the cemetery's chapel directly on the other side. At the top you hear everything. All the sounds of the cemetery. The creek running around you, completely, surrounding you. The ducks and the geese from by the bridge. The wind in the trees. The silence of being in the middle of the vast cemetery. 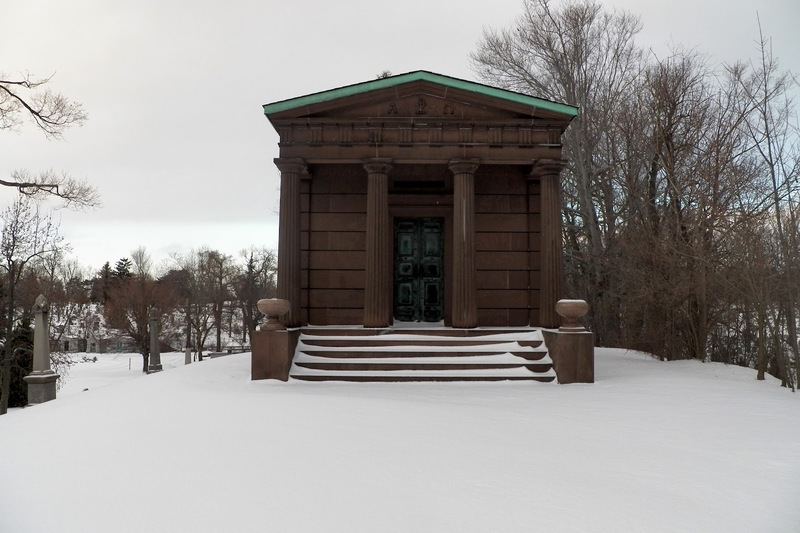 On this hill with what likely is the largest mausoleum in Forest Lawn, the mausoleum without a name.